I suspect that the child plucks its first flower with an insight into its beauty & significance which the subsequent botanist never retains. Categories: Uncategorized | Tags: child, first flower, Henry David Thoreau, quote, Thoreau | Permalink. to the coast for the day. near Coos Bay, Oregon. Beautiful gardens and beach coves. First pictured is a bed of roses. Next is one of dahlias with rudebekia in the corners. A bed of zinnias and snapdragons finish above photos. I saw a few varieties of hydrangea. And noticed how one escaped to live on the cliff. with the formal, fenced gardens on the other side of the path. In the Japanese Garden, I saw this beautiful, pastel fuchia shrub. The sedge looks so much like the papyrus in my own garden, but much taller. Both of these roses smelled so enticing. For me, that would be a criteria to get any rose award. Shore Acres is the middle State Park of three in a row. animals visit during the year. flowers and vegies alike. We had a good couple of days of rain in July that made everything grow like crazy afterward, especially the grass and weeds! No days over 100 degrees F (37.8 C) and very few days over 90 degrees F (32.2 C). 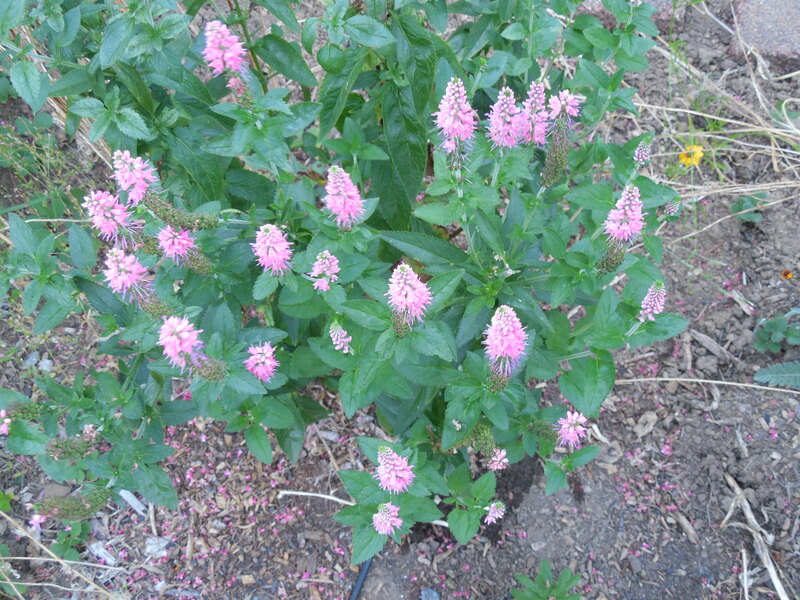 I believe the plants like this moderately hot summer. 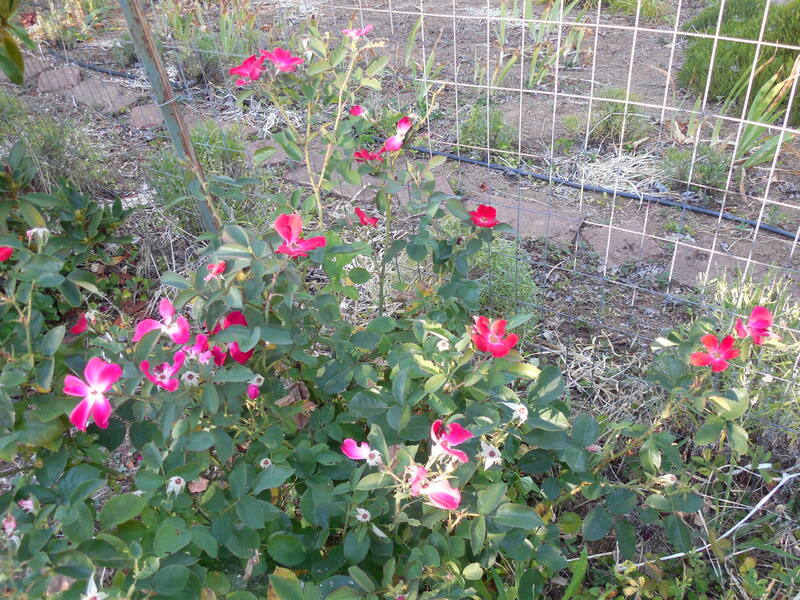 This Rose of Sharon plant has been here but a few years, and has grown significantly in that time. The blossoms are plentiful, but perhaps short-lived. Have not tried it as a cut flower, but do not think that is what it is known for. Asters seem to be flowering so early this year. so they must start later. Rudebekia, or Black-eyed Susans, are all a-bloom. I know these are great cut flowers. Crocosmia is in full bloom now. It thrives in full sun and is drought-resistant. 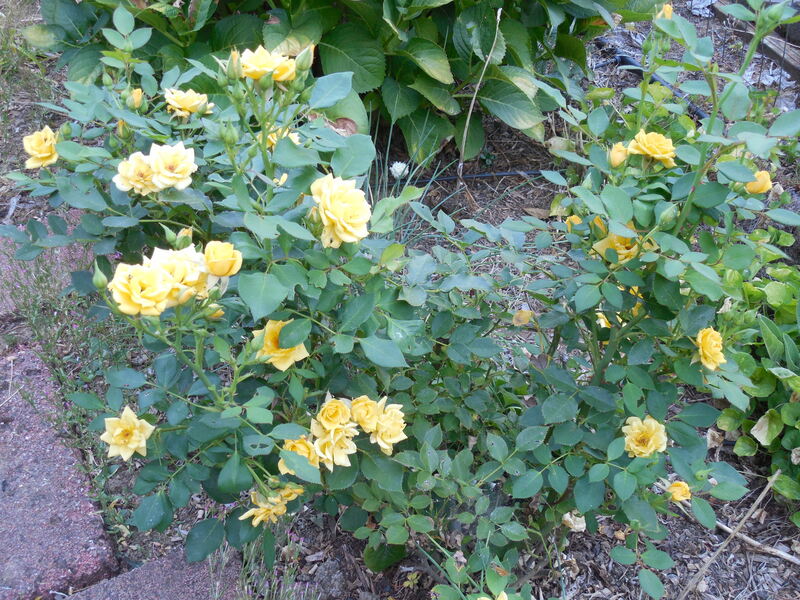 But watch out if it gets irrigated – it multiplies rapidly has taken over a flower bed. The baby corms take a lot of digging to eliminate from an area. Categories: Uncategorized | Tags: aster, Black-eyed Susan, crocosmia, Rose of Sharon, rudebekia, summer weather report | Permalink. There was an entire bed of artichoke flowers. Of course, not all at once, so I was able to enjoy them for awhile. 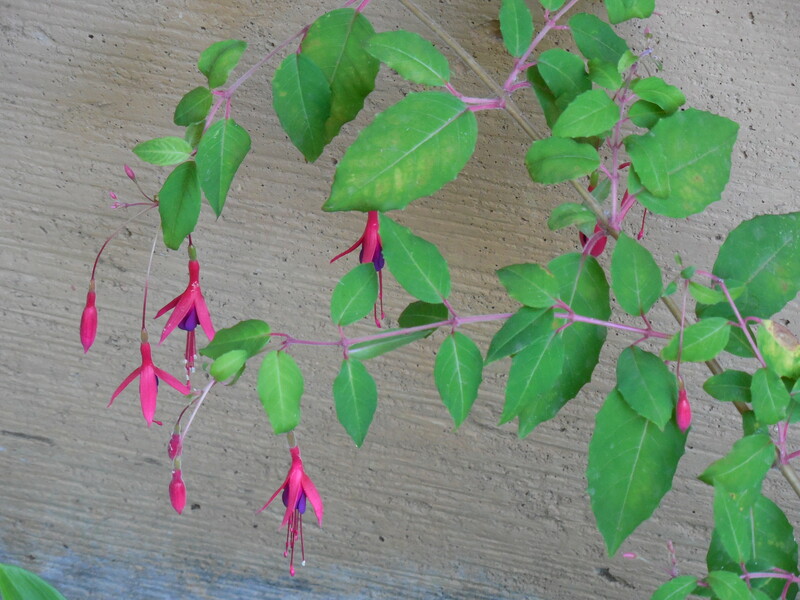 The outer leaves are prickly, but the inner purple part is so-o soft. thus they can dry upright. 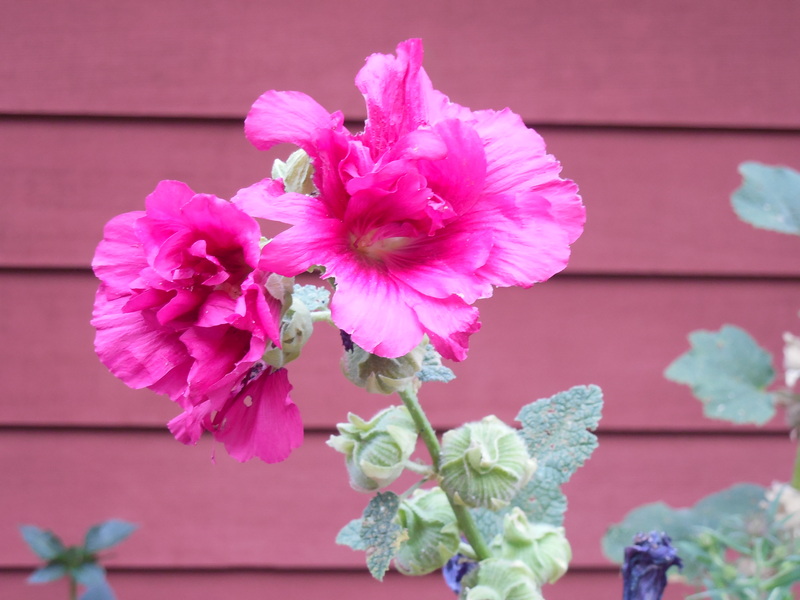 These are some of my favorite summer flowers, so showy. I have dead-headed most of my hyssop plants, but this moth found one of the last flowers. When the plant is in full bloom, the insects love it. Mexican oregano, outside my front door is part of the kitchen herb garden. These white flowers are also, very popular with bees and moths. 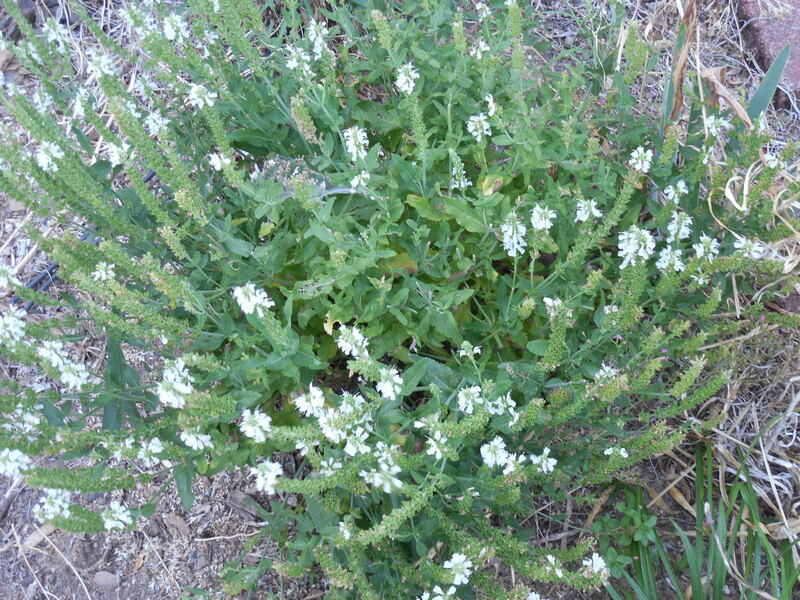 The small leaves of Greek oregano are more pungent than the larger leafed Mexican variety. I dried this type for use this winter. Not many of the pink flowers remain. Categories: Uncategorized | Tags: artichoke, dead-head, dried flower, garden, Greek, herb, hyssop, insect, kitchen, lily, Mexican, moth, oregano | Permalink.